I have a love-hate relationship with my kitchen. 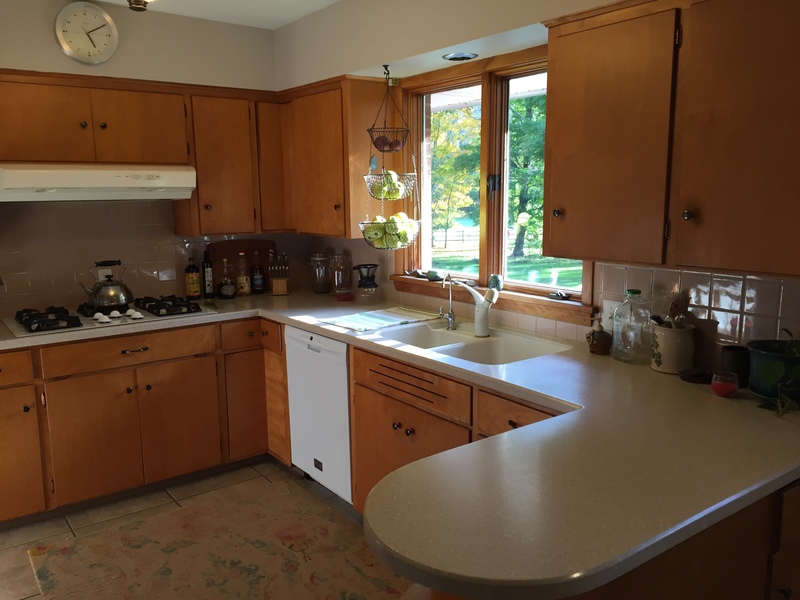 There are so many things I love about it: the gas oven and range, the way the windows look out onto our back yard, the Corian countertop, and of course – all the amazing storage I have. Seriously. The people who built our house were cabinet crazy. Our house has so much storage it is borderline excessive. But also wonderful. But then there are so many things that drive me bonkers about the space as well. It’s tiny. The oven is so incredibly small that there are a surprisingly large amount of dishes/bakeware that simply won’t fit. We outgrew our refrigerator about one kid ago but the space where it has to go only holds the smallest of small refrigerators. And last but not least – the awful, awful paint color. While most of these features aren’t easy to fix or change, the last one (and most noticeable to others), was fortunately both the cheapest and easiest to correct. I blame it on the pregnancy and that darn nesting instinct, but whatever it was, one day I woke up and simply could not go one more day with my kitchen it’s current color. I had to have it changed, and it had to happen pronto. It was this horrible mauvy-beige that made me feel warm inside and out, and cast this awful warm tint to the whole room. 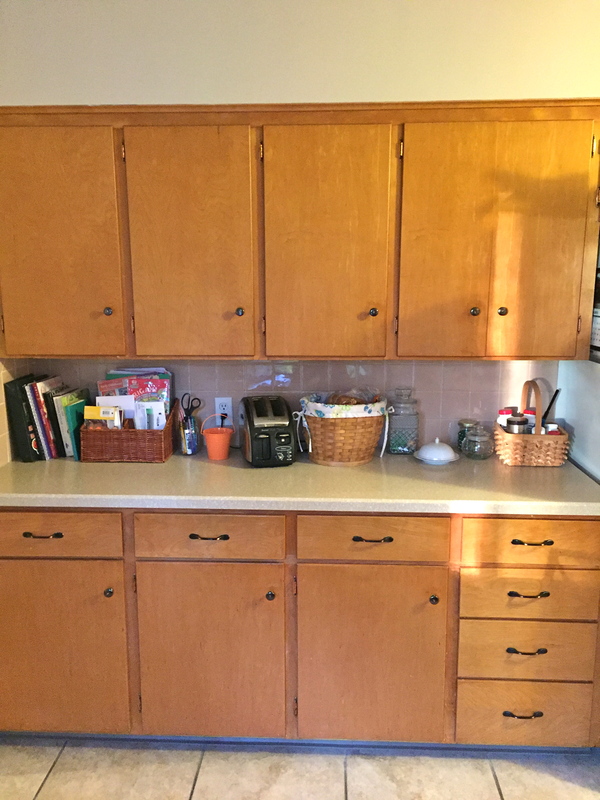 It made our yellow-wooded cabinets look orange, our beige backsplash look pink, and just generally annoyed the heck out of me. My husband, is an amazing man. I would not call myself a demanding person, but when I get something in my mind, I can be…how shall I say it…determined to see it through. The problem with most of my ideas is that I fancy myself the idea guy, with Mike being the “make it happen” guy. You see where this is an imbalanced weight of responsibility, right? 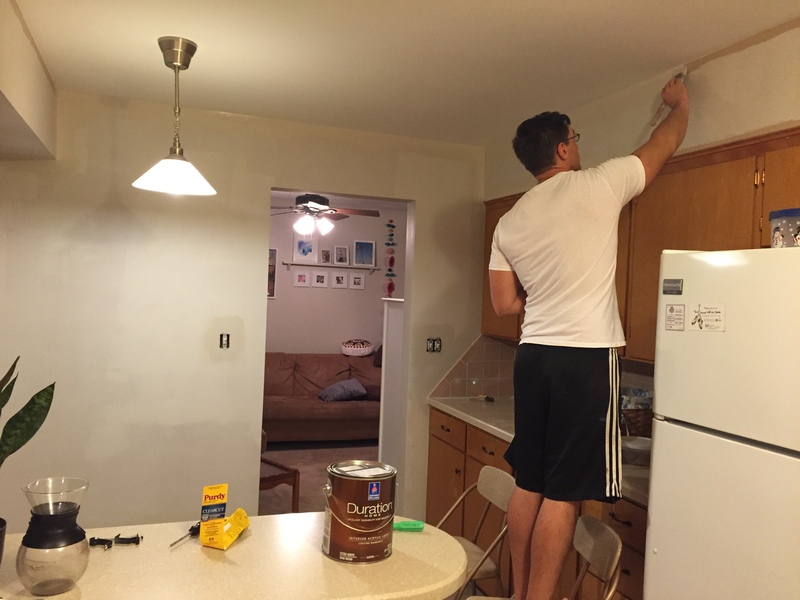 So Mike set to work, patching the walls and painting them the same color that we did our family room in – Modern Gray from Sherwin Williams. 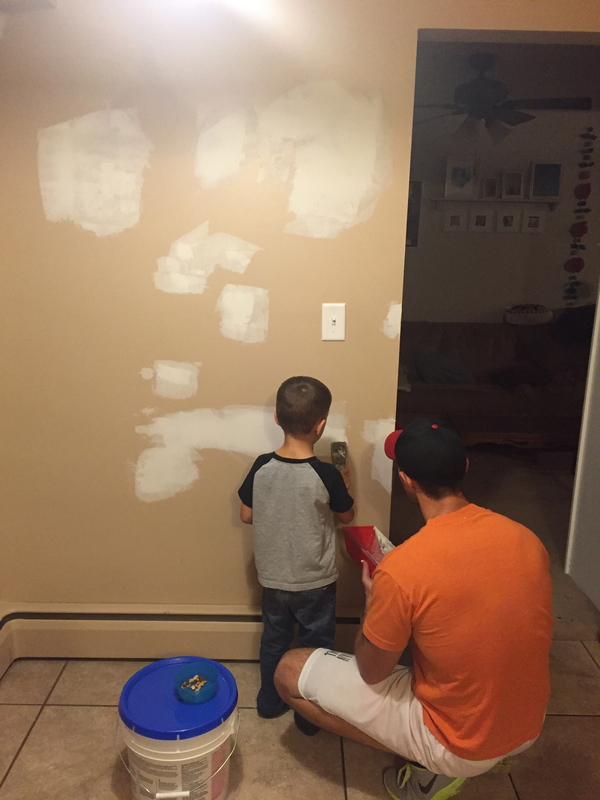 Mike and his little helper, mudding the walls. 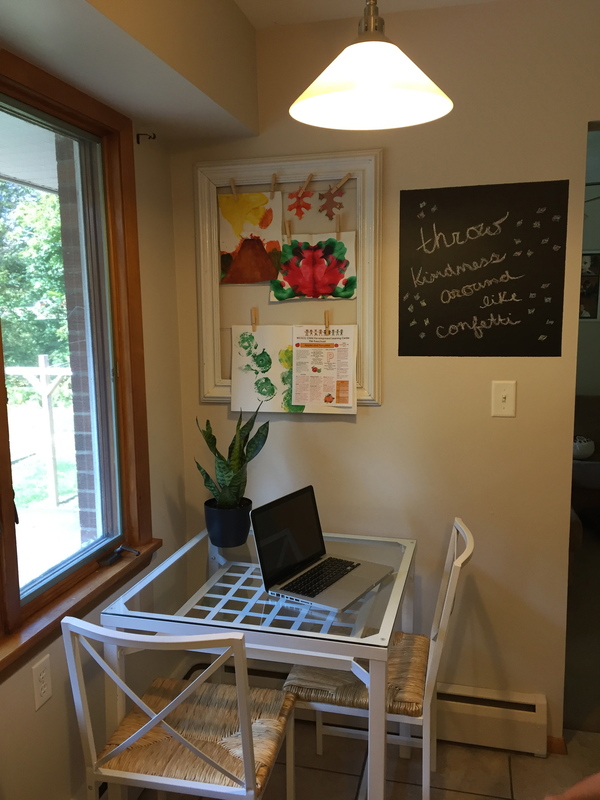 In addition to the new paint job, I wanted to create a family message center in our breakfast nook. 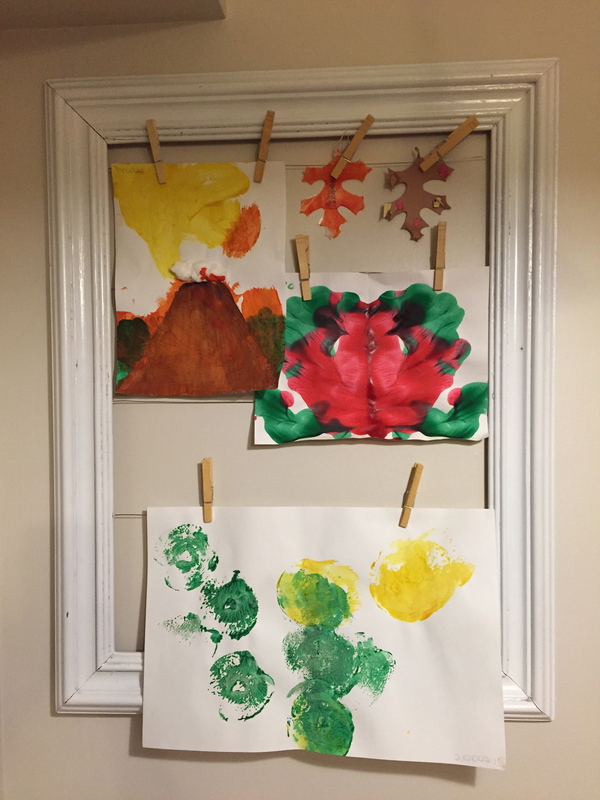 I wanted this area to be a place where I could display Theo’s artwork from preschool, where I could hang the beautiful cards that I get from friends (Jenna, your cards are just the prettiest! ), and where we could all leave notes for each other – including fun little quotes to inspire us all. 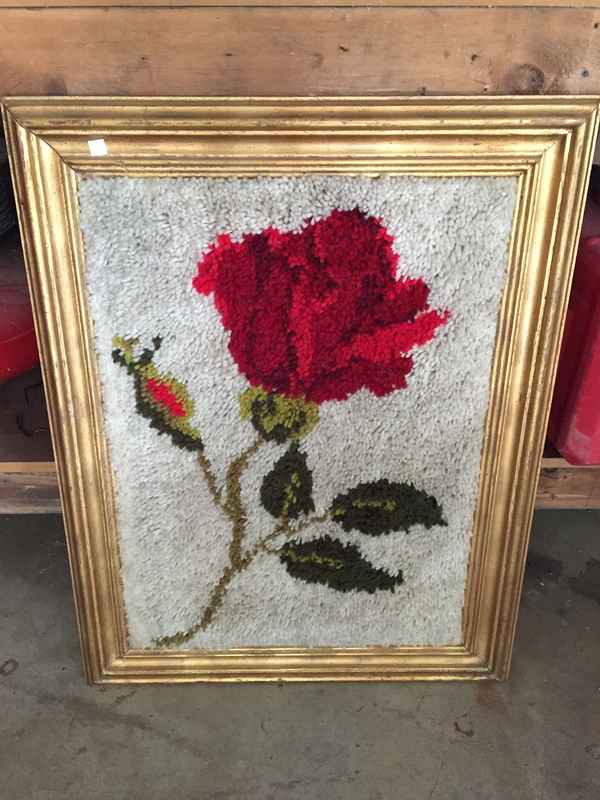 I went to a thrift store to find a frame for a DIY art display. They were having a framed art sale so I was able to get this huge frame for $2.50 (although I think it’s a biiiit of a stretch to call this, ahem, thing – art). I felt a little silly carrying it up to the register because, as you can see, it’s hideous (I hope the person who made this doesn’t read my blog…). I even got a raised eyebrow from the cashier; I quickly informed her I was just buying it for the frame. I liked this piece because it didn’t have glass. I’m not sure what I would have done with an extra piece of glass that size, and I’m glad I didn’t have to worry about coming up with a solution. Mike removed the ugly rug, spray painted the frame white, and strung wire across the back for me to be able to hang artwork (he staple gunned the wire). The frame already had a picture hanger on the back so we didn’t need to bother adding one. We already had the wire and the spray paint, so this project literally cost $2.50. Mike applied chalkboard paint next to the frame for my little message board/inspirational quotes/grocery lists. I love it so much. 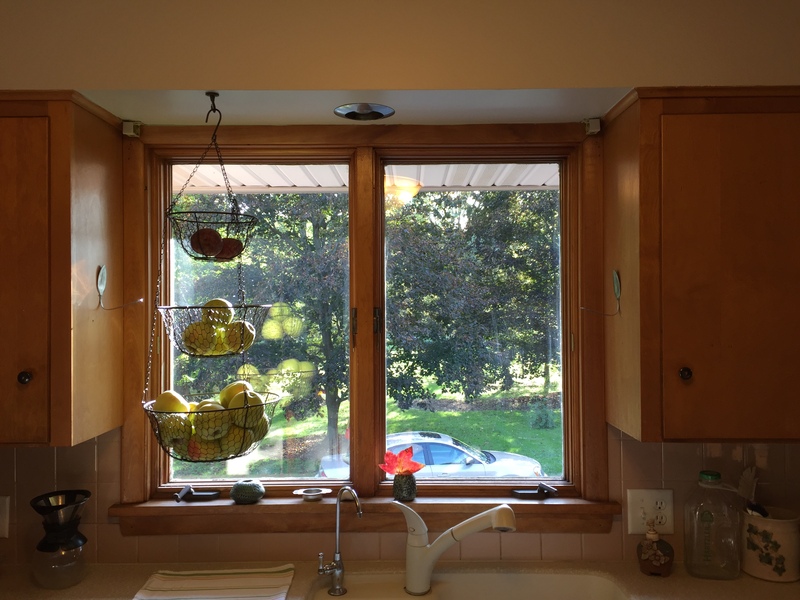 I also added a chicken wire hanging basket over my sink area to hang all my fresh produce. I guess I tend to like the homestead style for a kitchen. You know, I store my dried beans in Ball jars, I use bent spoons attached to the wall to hang dish towels, and now I’m a proud owner of a chicken wire, three tired, hanging basket. It’s all good. 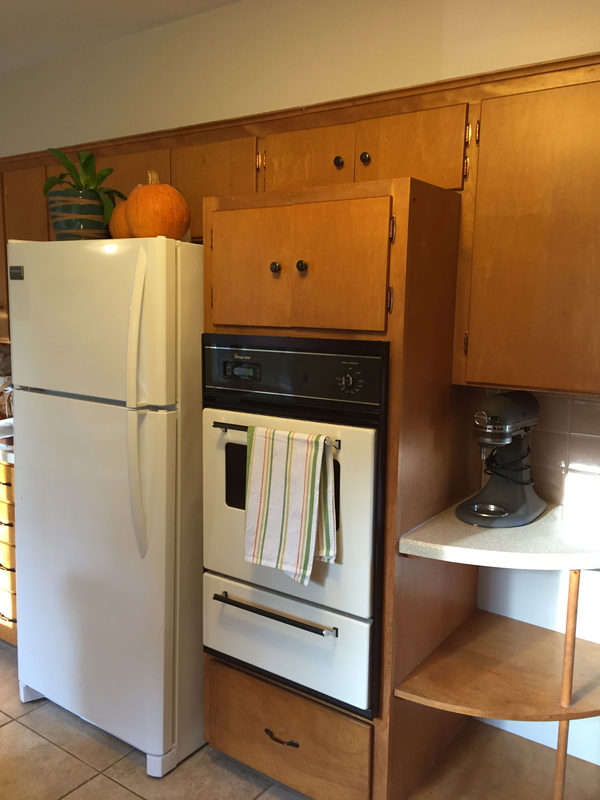 All these changes were simple and inexpensive, but they went a long way in making our kitchen feel fresh and updated. I love my shelf for my cookbooks. The doorway to the left leads to the dining room/living room and the exterior door leads to our patio. This is the space next to the refrigerator, on the opposite wall as our breakfast nook. As you can see, we have a ton of storage here! 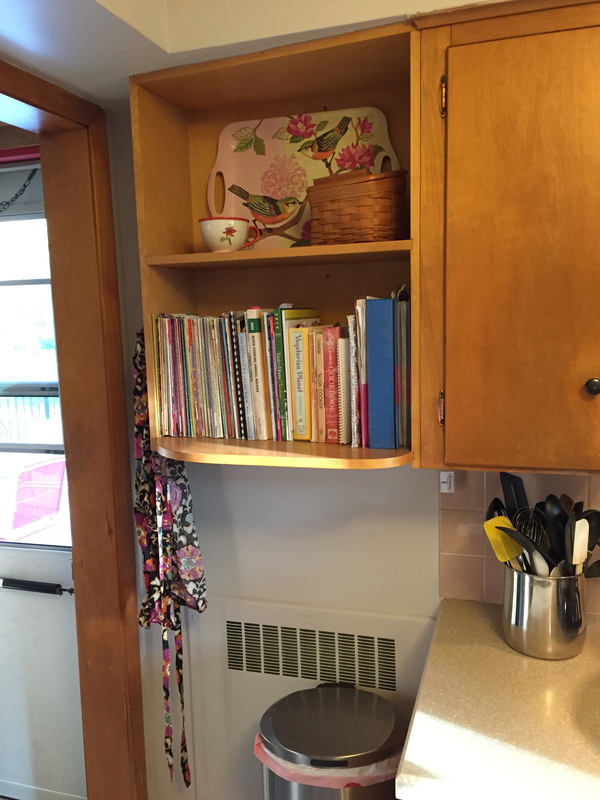 This is also where I store books/cookbooks I’m reading, our bread basket and toaster, and Theo’s marble jar. It is also a convenient place to serve food for large groups. That’s it! That’s our kitchen! I love your house, it seems so cozy & comforting – a great place to grow up! & it makes me want to go bake a pie, hehe. What a nice compliment! Thanks girl :-). I hear that! It’s a good thing I’m a vegetarian because I will never be able to roast a turkey in my oven, lol. It make’s holiday cooking a bit tricky, so I’ve had to learn to only plan on one oven-baked dish per meal and cook the rest on my stovetop.